Even though you think of controls as atomic elements, there is XAML inside the control to define the look and feel of the control. 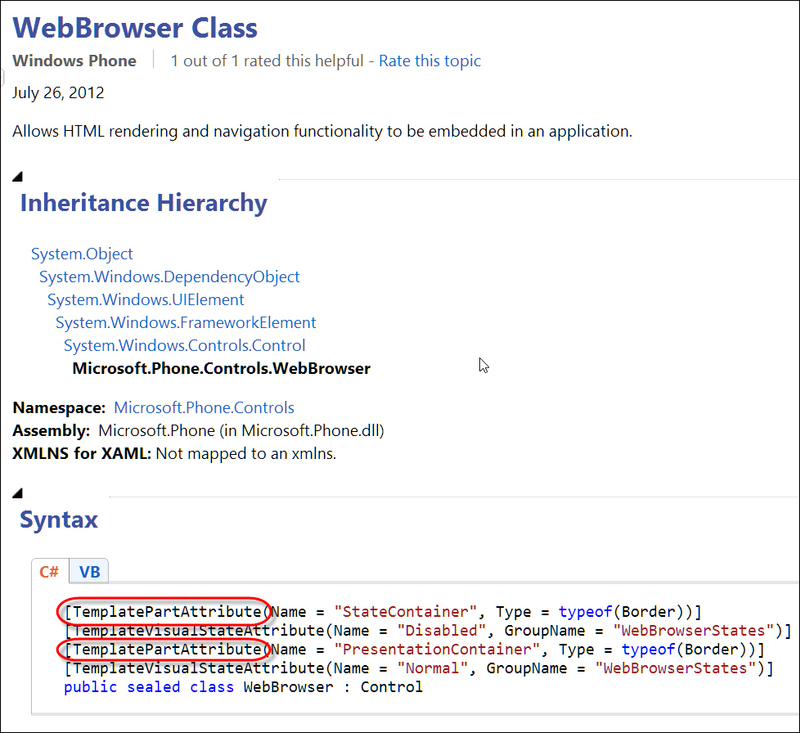 Control templates are used to redefine this XAML for any control. By using template bindings, the natural value of the property will be used as the value inside the control template. This value could come from the default value in the control or from a style setter, or it could specifically be set on an instance of the control. Template bindings allow you to use whatever property value is supposed to be shown in the control. 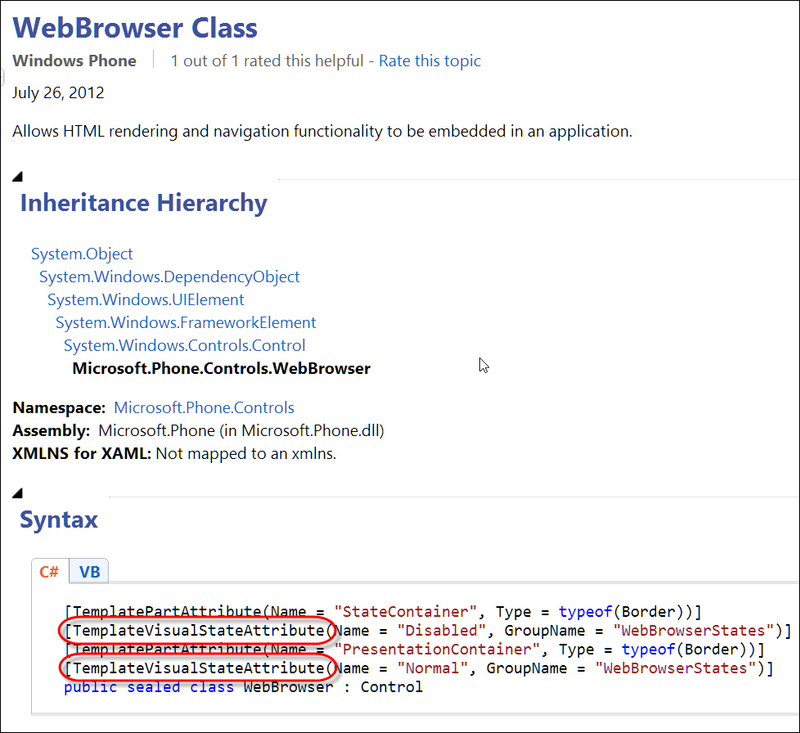 For some controls, the XAML must have certain elements to make sure the control still works. For example, the WebBrowser control requires that part of the XAML be a Border element named PresentationContainer. That way, the control knows where to show the Web content. This contract between you and the control author is called a template part (many controls do not have any template parts). The template parts that are required are documented as attributes on the controls themselves (as shown in Figure 6). The structure of the XAML in a control template represents the look of the control, but in addition you can specify the feel of an application. The feel of an application is the way the control can interact with the users. For example, the Button class changes its appearance when pressed to give feedback to the user that she has correctly pressed the button. This is how the feel of an application works. You can create the feel of an application using a structure called the visual state manager. With the visual state manager you can define animations that represent a state the control can be in. The control uses the visual state manager to go into specific states as the user interacts with it. As the application designer, you can define these states to change the way the control interacts with the user. These states are broken up into groups so that a single control can be in more than one state. For example, two of the visual state manager groups that the TextBox has are CommonStates (which represent states such as Disabled and ReadOnly) and FocusStates (which represent whether the control has focus or not). The groups define a set of states where only one state can be active at a time. For example, you can have your control be Disabled and Focused, but not Disabled and ReadOnly. The states in a group are mutually exclusive. As this example shows, the VisualStateManager.VisualStateGroups attached property contains one (or more) VisualStateGroup objects. Inside the group is a list of VisualState objects that represent a storyboard that shows how to go to a specific state. The empty VisualState objects mean the state should look exactly like the natural state of the object. The visual states and groups that a control supports are also specified as attributes on the control classes, as shown in Figure 7. When creating your own control templates you will need to be aware of the template parts and template visual states, as that is the contract between you and the control author. You must implement these states and parts if you expect the controls to continue to operate correctly.